While Viacom International Studios gears up for the inauguration of its 88,000-square-foot production facility in downtown Miami, Miami Dade College’s new animation studio MAGIC is ready to welcome its second wave of students this spring. The business community aims to harness local talent as digital media companies and a slew of tech-minded businesses are increasingly calling Miami home. As the senior VP of research and strategic planning of the public-private organization that seeks to add jobs in Miami-Dade County, Mr. Donath keeps track of companies coming in and out of town. While the “digital media” category has yet to be specifically defined and lives fluidly among Miami’s expanding information technology, entertainment and media industries, Mr. Donath listed off examples pointing to its growth. First, he said, is MAGIC. Miami’s newest animation studio, the Miami Animation and Gaming International Complex (MAGIC), recently opened at Miami Dade College’s Wolfson Campus. The 9,000-square-foot facility was completed in May and welcomed its first class in August, offering two associate degree programs, one in animation and game art and another in game development and game design. The studio’s popularity among students has “exceeded our expectations,” said Mauricio Ferrazza, the facility’s chairperson. Mr. Ferrazza was expecting 50 students to enroll the first semester. Instead, he opened with 80 and is expecting 150 more for MAGIC’s second semester this spring. The idea to bring a college-based animation studio to Miami came about when Mr. Ferrazza noted a disconnect between the county’s job availability and its qualified employees. During his research, he found 1,500 available jobs that animators and programmers would qualify for, yet 85% of such professionals were being recruited from out-of-state. Today, the video game industry is slowly molding its own hub in Miami. The most poignant example is Shiver Entertainment, a digital gaming startup based in South Miami, which, backed by help from the Beacon Council, expanded to a new facility in 2014, creating 60 additional jobs. Miami’s gaming image is further strengthened by the presence of Shiver’s CEO John Schappert – a renowned name in the gaming industry, Mr. Ferrazza said. His aim for MAGIC is to prepare students to work in the burgeoning industry as well as encourage the graduates to open their own Miami-based businesses. “We create the talent and help the industry grow, so we’ll have jobs for the talent coming out of MAGIC,” he said. Another win for the local digital media industry came this fall when Viacom International Studios, which has operated in Miami since the early ’90s, announced it would launch an 88,000-square-foot, two-stage production studio downtown. 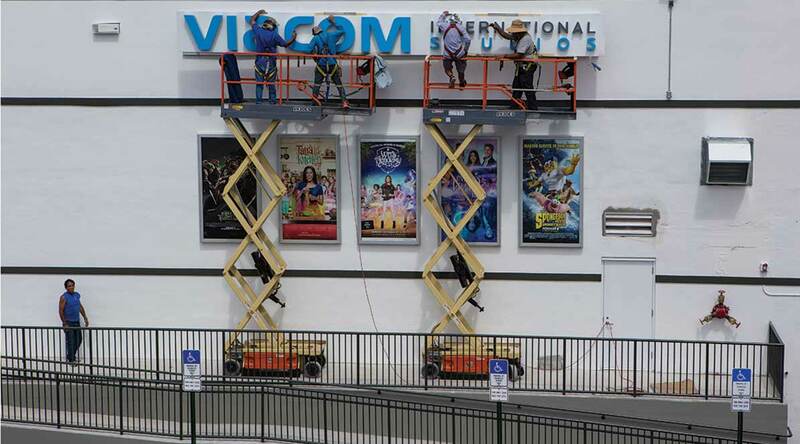 The new facility, which was built by the Miami Omni Community Redevelopment Agency as a public-private partnership with EUE/Screen Gems Studios, is to open in January as a production hub for Viacom’s global entertainment brands: MTV, Nickelodeon, Comedy Central and Paramount Channel. Viacom manages its Latin American, US-Hispanic and Canadian markets from Miami. This year alone, local operations produced 100 half-hour episodes for Nickelodeon-US, said Juan “JC” Acosta, executive VP and COO of Viacom International Media Networks Americas. Ninety percent of the production and talent staff is acquired locally, Mr. Acosta said. The company has tapped into a new mode of production in Miami. Viacom is taking Spanish language productions and translating them into English versions. Every Witch Way, for example, is the American version of the Nickelodeon Latin American show Grachi. The locally filmed show just wrapped up its fourth season, Mr. Acosta said. Viacom wants to create an international hub of production for both its Spanish and English language shows in Miami. The local talent base is evolving, and “we’re making investments and bets that Miami” can be the next media hub similar to New York or Los Angeles, he said. But the local entertainment and film industries continue pushing to revive the state’s tax incentive program, which helps lure out-of-state productions and keep local companies headquartered here.